Egypt’s military regime has unleashed a violent crackdown against all forms of dissent. Activists who led the revolution in 2011 are now behind bars on trumped up charges or simply for taking part in peaceful protests. Hundreds of regime opponents have been condemned to death in trials which Amnesty International called ‘grotesque’. Journalists are being jailed for up to ten years as the generals try to stifle any kind of criticism. 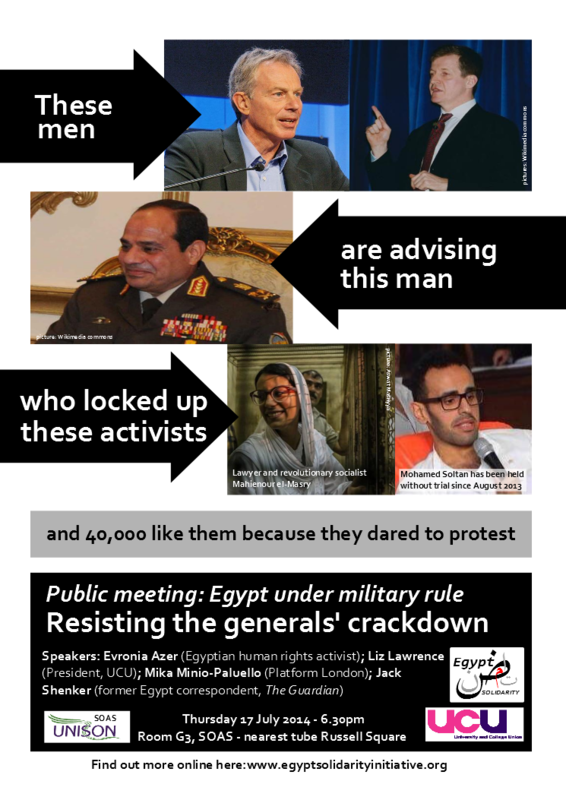 Yet activists in Egypt are still regularly risking arrest, torture and even death by resisting the military regime at a time when even the most symbolic protests are being met with massive repression. This meeting will ask how we can make sure their voices are heard by the millions of people round the world who were inspired by the Egyptian revolution’s call for bread, freedom and social justice? And how can we turn the heat up on our own governments for backing the generals’ dictatorship with arms and diplomatic support? A call by activists in Egypt for an international mobilisation on 21 June against the repressive protest law saw solidarity actions take place in nine countries – how can we build a bigger and broader movement in future?